Had my first ride in a Tesla a few days ago, and as you might expect - I was pretty thrilled. So much so that I thought I would capture a few of the aspects that impressed me most. You might expect from my post about the cons of dashboard screens in cars that this wouldn't be at the top of my list. I maintain that these screens will be obsolete before the car has served it's useful life of 10 years or so, but I was definitely marvelled by these beauties. The centre screen is a 17" glass covered touch screen that looks, feels, and responds iPad like (in my brief experience) The resolution is excellent, and the software finely crafted. The most quintessential wow moment? Opening the sunroof by swiping a picture of it in the desired opening direction, and having it animate along with the physical roof. Intuitive, effective, and well executed. This is my favourite new fact about the Model S. Announced last week, the battery can be swapped out by an automated system in 90 seconds - faster than it takes to fill a gas tank. The video below shows it in action. I think this is exciting because without swappable batteries, electric cars will only be suitable as a second car for around town for the foreseeable future. This is about how much your clothes dryer uses in a year. For comparison - a small Tesla S battery = 60 kWh. 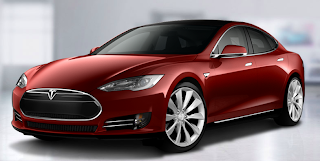 To charge the small Tesla S battery in 1 hour would take 100 Amps at 600 Volts. This is quite a draw - a significant industrial machine with big throw switches uses this sort of power. This is the kind of wallop you get when a lightning strike hits, or is drawn daily by a pretty large office building. There are plenty of chemical reasons why current battery technologies don't charge that fast, but you can imagine it will be quite a while before the electrical grid is able to deliver this type of capacity. I'm sure it has been written more eloquently elsewhere just how smooth and quiet the ride is in the Tesla S, but it's one of those experience-it-to-understand it things. No gears to switch through, no electric whine, just a smooth, solid ride. The electric motor is compactly positioned in the rear of the car. That leaves all the space the engine used to take up under the hood and plenty of space in the rear as well. You might have imagined this would be the case, but it really is amazing to see. The engine, the radiator & cooling system, exhaust system, and especially the transmission take up a lot of room in a combustion-engined car. With these systems gone, there is all the room in the front of the car for storage, and inside the car where the hump from the transmission is usually - is eerily, but pleasantly empty.